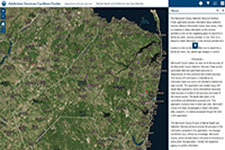 Geographic Information Systems (GIS) technology uses computer based tools to create, store, analyze, and display data. It enables the understanding of patterns and relationships linking data with geographic coordinates or features to communicate information spatially. GIS provides a common visual language that helps the user understand what belongs where. To better assist you, please call or e-mail ahead of your visit to discuss your needs with the GIS staff. Upon arriving at the Division of Planning offices, please check in at the front desk. Appointments are not required but are recommended. 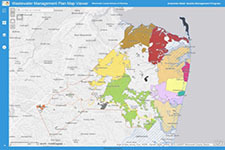 Monmouth County Wastewater management Plan Map Viewer with updates through April 2017. 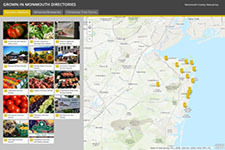 This web mapping application can be used to locate farmers' markets and other businesses affiliated with the Grown in Monmouth program. The Monmouth County, NJ Division of Planning began working with the County Community Rating System (CRS) Assistance Program to compile data on the location of high water marks throughout the county resulting from Hurricane Irene in 2011 and Superstorm Sandy in 2012. 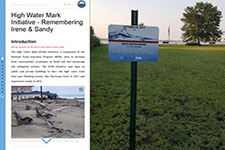 The High Water Mark Story Map is accessible online where one can find the location of the signs throughout their community, as well as learn about past flooding events. Through this technology, the County and its Municipal partners create virtual tours of our past flooding events bringing awareness and education to all ages. A photographic tour about the agricultural, environmental, & historical sites along the Upper Freehold Historic Farmland Scenic Byway within western Monmouth County, New Jersey. A new property viewer mapping application is available for searching for locations, viewing estimated property boundaries, and aerial imagery. This app is available for public use and replaces the legacy application which is no longer supported. The property viewer mapping application is a beta version; not all functionality may be present but will be added to the tool when available. The legacy property viewer application will no longer be supported. Some tools within the existing Property Viewer may no longer be operational – using a different browser may resolve the problem. Otherwise, please contact GIS staff if you are seeking details about a specific property. Explore the Monmouth County Arts Corridor within an interactive web-based tour. Currently featuring art installations within Belmar; plans are underway to expand this web mapping application throughout the County.